These are certainly interesting times in Maryland racing! With all the glamor of the Triple Crown, it could be easy to overlook that we have just had several very significant milestones in Maryland racing…milestones that could signify significant turning points. And these milestones are a bonanza for headline writers! “Maryland’s Arab Uprising” or “Arab Spring in Maryland” (about the “decriminalization of Arabian horse racing in Maryland–-who knew it was illegal?). “Mutiny due to Bounty” (Maryland Thoroughbred Horsemen’s Association [MTHA] members, outraged at what is perceived as their captain’s undue booty bounty, mutiny). And then there are the new drug protocols, likewise beckoning for headlines. But before we delve into all that, we would like to report that the true power behind the Preakness, Georganne Hale, is finally getting the journalistic kudos she so richly deserves, with this lovely interview on Baltimore’s WBAL Channel 11. A coup d’état or a democratic victory? Hoffberger has served as president of the Maryland Thoroughbred Horsemen’s Association since it was founded three decades ago. The MTHA is not just any old club of horse people, getting together to ride, show or hunt and have potlucks. The MTHA, which represents all the licensed Thoroughbred flat track trainers and owners, has the critical task of negotiating with the Maryland Jockey Club for racing days, purses, payouts, control of the simulcast signal and oversight of workman’s compensation insurance for jockeys. It is, in effect, a trade union that negotiates with management. It lobbies lawmakers and represents horsemen in legal matters before the Maryland Racing Commission. And it has the authority, under federal statute, to permit or prohibit out-of-state wagering on Maryland races. In other words, there is a lot of money involved with virtually all of MTHA’s functions. MTHA is run by a board of directors, which is elected by the general membership (every licensed owner or trainer is an automatic member). The board would then elect, from its own ranks, the officers. This is the comfortable construct within which Richard Hoffberger has served as president since the MTHA was founded. However, on April 30, in a vote of 126 to 115, the general membership of the MTHA overturned this structure with a change in the bylaws that will now require that the general membership elect the officers, rather than the board. A simple change–what some might argue could be called a coup–that could dramatically alter the future of Maryland racing. The MTHA is controlled by a handful of individuals led by Richard Hoffberger…while there may have been a time in which Maryland racing benefited from his leadership, that time has now passed. Over the period of my board service [ed note: at that point, roughly 6 months], the MTHA has repeatedly acted without board approval in several significant ways. Richard Hoffberer, without board as approval, engaged and consulted with “our accountant” to evaluate the Bowie-Laurel lease proposal. Richard Hoffberger, without board approval, authorized the funding of over $1 million in premiums for the jockeys’ workers compensation cost from the horsemen’s purse account. In that regard, Richard Hoffberer’s agency receives commissions for such insurance and when specifically asked to disclose the amount of this compensation, Richard Hoffberger refused to do so. Richard Hoffberger decides what committees of the board will exist, selects the members of those committees, what those committees shall do (or not) and himself becomes a member of each committee. Those committee meetings are then closed tog any other board member. The current purse and stakes schedule was reportedly approved by the MTHA but no board meeting considered this. Board meetings are held when and if the MTHA leadership decides to do so. Similarly, that leadership, not the board, cancelled this past year’s Christmas party; fortunately, they were not able to actually cancel Christmas. Hoffberger, understandably, reportedly takes umbrage with these comments, but has apparently refused to go on record to refute them. The Paulick Report and the blog for That’s Amore Racing Stable have followed the issue closely and have provided excellent coverage, and ample opportunity for Hoffberger to publically express himself. Regardless, Johnson gathered enough signatures to force a general membership meeting to vote on proposed bylaw changes, and won by a narrow victory. The president and the vice president will now be elected by the general membership to serve one-year terms. Hoffberger is not necessarily dethroned. He could be nominated (nominations are due by May 15); he could accept the nomination, and he could stand for election (which will be held July 1). Will he? Rumor is that he won’t, but let’s not count Hoffberger out yet. Let’s just wait and see what happens. But isn’t this all rather fascinating? For more background, we recommend The Paulick Report and the blog for That’s Amore. 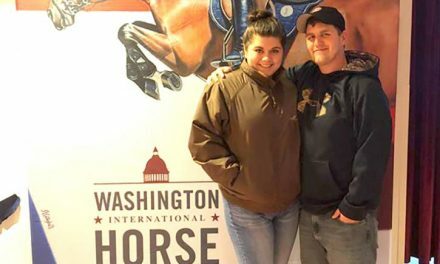 Yeah, we knew we did not have Arabian horse racing in Maryland, but who knew it was legally prohibited? Thus, when Abu Dhabi dangled $75,000 in front of the Maryland Jockey Club in order to entice them into adding a Grade 1 race for Arabians, it took the proverbial “act of Congress” to make it happen–or in this case some lickety-split legislation romping through the Maryland General Assembly and signed into law by the governor in the nick of time. Now featured on the Preakness card on May 19 is The President of the United Arab Emirates Cup, a the $75,000-added Grade I race for purebred Arabian horses. The race is limited to 14 horses and will be run on the main track at 1 1/16 miles. The Maryland Racing Commission has approved new protocols for positive drug testing; however, while the MRC has approved some new protocols, some national legislators are using what has been called “Maryland’s regulatory anarchy” to spearhead national legislation that would transfer regulatory oversight away from the states to the federal government. One hundred plus years ago, jockeys in America were predominantly black (although “black” was not the common term at that time). A white jockey was a rarity. Today, black jockeys are so rare that some just assume riding racehorses has always been the exclusive province of the white man. Regardless, there are several lovely articles recently published in mainstream media about Maryland jockey Malcolm Franklin, but the hook for the articles is that he is a rare black man in the irons. Six race horses were in the Ebert van that flipped in an April 18 rainstorm along I-95 in South Carolina while returning to Fair Hill from Palm Meadows; one horse had to be euthanized. The horses were owned by Maryland-based AJ Suited Racing and trained by Jimmy Toner. The other five suffered only minor injuries. For more details, please see The Paulick Report. No surprise here! Slot revenues are helping the Jockey Club’s bottom line. Yeah, um, wasn’t that the idea in the first place? Anyway, MJC is required by law to submit financial reports to the Maryland Racing Commission, and the Baltimore Sun’s Hanah Cho offers this analysis of those financials. Maryland is about to get infected with Black-Eyed Susan fever…it lasts approximately one to two weeks and leave those infected exhausted. Click here for The Equiery‘s picks of Preakness Celebration activities! Walk the Preakness Barns with The Original Lady Legend, Kathy Kusner! And don’t forget to join The Equiery on Friday, May 18 for Lady Legends for the Cure at the Black Eyed Susan Stakes. MJC is once again extended an exclusive rate to Equiery readers for “Stable Tables” in the Turfside Terrace. Equiery readers who reserve Stable Tables will be invited to go on a private Preakness barn tour with Olympic legend Kathy Kusner! Click here for more information. PreviousIs Anne Arundel hostile to Ag?